R&R Lotion SD-6-ESD Solvent Dispenser 6oz. - Standard Pump - ESD Safe - Blue. Does NOT contain Exthoxylated tertiary amine. ... See: Additional Product Information. R&R Lotion has developed a new process of molding polyethylene bottles with a concentrate that does not contain Exthoxylated tertiary amine, which is widely used as an anti-static agent. 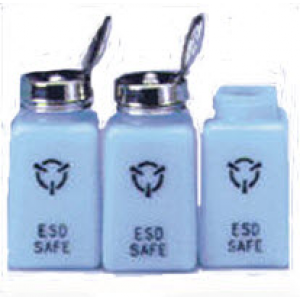 These ESD safe bottles have an average surface resistance of 109 to 1010 and do not have the less undesirable features associated with surfactant layden material. The Bottles will dissipate a charge of + 5000 Volts in less than 2 seconds at 40% R H ! By their chemical nature, the bottles will not have any chemical reactivity with such solvents as TCE, or alcohol. The pH of the DI water solutions tested were the same before and after a seven day period. No color change or any other physical changes were noted for any of the solvents tested. Product Specifications: Static Dissipative - Complies with EIA interum STD5. Triboelectric Charge : "None" Electrical Properties : Surface Resistively 1x109 - 1x1010OHM/SQ Static Decay : 5KV to 0.0 KV (FTS 101/.4046) < 1.0 SEC Solvent Resistance TCE Parts Per Million : 97 IPA parts Per Million : 52 H2O Parts Per Million : <5.